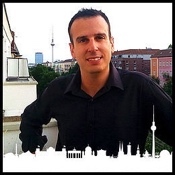 Traveler Review for Private Tour in Berlin, Berlin, Germany by Tour Guide Nadav J. About Nadav J. Message Nadav J.
Nadav is an outstanding guide who provided four of us with a great tout of Berlin. In 3.5 hours walking, Nadav presented history fairly, giving us with a far better grasp of Berlin and German history than we previously had. We were able to visit many historical sights and given full explanation of each sight's importance. All four of us highly recommend Nadav and Toursbylocals.com for a great experience. TOUR GUIDE RESPONSE: Thank you all for a great tour and the reference ofcourse! its a big plesure to see the reflection and curiosity in the eyes of my clients and to know that the time i spent learning the history of Berlin can move souls! Thanks again!